Did Nokia Pull an Osborne? One of the great folklores of the technology industry is the story of the Osborne Computer Corporation and their demise due to an ill-timed product announcement. According to the tale (of which the details may or may not be accurate), Osborne pre-announced an upcoming new computer in an effort to stave off competition. But instead of wooing customers from their competitors, this announcement led to the sudden cancellation of orders for their current computer model. They could not ship their new model for several months, inventory piled up even with drastic price cuts, and in the mean time, the lack of cash flow killed the company and they filed bankruptcy. Regardless if it is completely accurate, the story is so well-known that the term “Osborning” or “pulling an Osborne” is understood to mean when a company’s announcement of a future product kills the sales of its current products. I bring up this bit of tech lore because perhaps Nokia has Osborned its current line of Symbian smartphones, or at least it seems they are very afraid they have. By publicly aligning themselves with Microsoft’s Windows Phone 7 operating system, many questions arose over the future of the Symbian line of phones. Nokia didn’t do themselves any favors by not clearly defining their intention for Symbian. They only gave a very confusing statement by calling Symbian their “franchise platform”, virtually ensuring that anyone who has any vested interest in the platform was left in limbo. I myself questioned how Nokia would be able to successfully split focus among Symbian and Windows Phone 7. Now a Microsoft executive is publicly urging Symbian developers not to abandon that platform. This is highly unusual that an executive of a company tries to bolster a platform with which they virtually compete. Of course, now that Microsoft and Nokia have partnered it is somewhat understandable, but it is still very strange that Microsoft would make this announcement instead of Nokia. It appears to me Nokia fears that the Symbian development community doesn’t believe what Nokia is saying so they figured they might believe Microsoft. Yet, even Microsoft’s statement is confusing as in virtually the same breath they encourage Symbian developers to stick with it, they also encourage them to get familiar with Windows Phone 7. The entire situation reminds me greatly of politicians spinning damage control. The common perception is that Nokia is abandoning Symbian and so developers are hesitant to continue to support that platform, and I’m sure certain large corporate buyers are questioning the platform as well. Nokia is trying to manage the situation so that they don’t get Osborned, because if the bottom falls out of the Symbian market before they get rolling with Windows Phone 7, it could greatly hurt Nokia’s chances to remain a significant player in the smartphone market – which ironically is exactly what they are trying to achieve by partnering with Microsoft. As I mentioned in my previous article, this is the risk they felt they had to take, but perhaps they didn’t anticipate the Osborne Effect. Which just goes to show that those who don’t study their tech history are doomed to repeat it! A few days ago, Nokia CEO Stephen Elop sent a memo to his company admitting what was clear to most in the industry: Nokia has fallen way behind in the smartphone market. He used an analogy of a man standing on a burning oil platform in the North Atlantic. The man could either stand on the platform and die for certain, or he could jump into the frigid waters and risk freezing to death. While the man would never have jumped into the water under any other circumstances, it was his only chance at survival. So he leaped. He relates this story to Nokia. The current situation dictates they must make a drastic decision or face certain doom. Today, Nokia and Microsoft announced a strategic alliance where Windows Phone 7 will become the primary smartphone platform for Nokia. Also significant, at least within the organizational structure of Nokia, is that they will split their mobile business into two units: Smart Devices and Mobile Phones. My first thought was that this alliance would be beneficial for both companies. Nokia gets a modern smartphone platform and Microsoft gets the support of the largest cellphone manufacturer in world. However, on further inspection, this isn’t necessarily a slam dunk. It is interesting that Nokia has chosen to split their operations between “smart” devices and “non-smart”. It speaks to their view that the two markets are so distinct that they should completely separate the two. Is this the right decision? Time will tell, but can a company sustain two separate focuses like this? It may be that they must to have any chance of success. If one fails, the other may survive. Also interesting is that Nokia will retain their previous flagship platform, the Symbian OS. They are now calling it their “franchise platform”. This very vague description makes it difficult to understand what Nokia’s intention is. Yet, it is clear to me that they are still following the same path that the “old guard” of the smartphone industry have followed: place their bets across various different platforms and various different form factors and carriers. Nokia’s CEO acknowledges that Apple changed the game, in fact using that very phrase. Yet he apparently fails to grasp how they did it: by focusing. Apple didn’t create multiple form factors and didn’t attempt to spread their phone around every carrier they could. And they definitely didn’t create multiple operating systems. And I don’t know about you, but comparing your new business partner to jumping in the the North Atlantic doesn’t exactly make it sound like a trusting relationship. But then when you’re getting into bed with Microsoft, I guess it doesn’t hurt to sleep with one eye open. So looking at the deal, while it could be a powerhouse arrangement, I don’t believe either company has the marketing prowess to make it highly successful. This is primarily because both companies don’t have the necessary focus. Microsoft is still courting other phone vendors, and Nokia has other platforms they are still clinging to. So unless both companies are willing to completely commit to each other, like any marriage, it just isn’t going to end up well. I am lucky enough to know someone who received their Verizon iPhone today. I took a picture of it, which you can click to zoom in if you wish. She mentioned she had a lot of trouble getting it activated, primarily due to the incompetence of the first Verizon support representative she talked to. The second one got her up and running right away. That “Verizon” in the upper left corner sure looks weird! 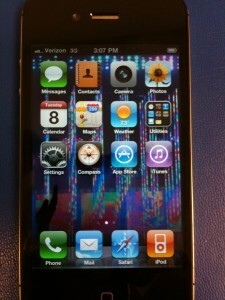 I also perceived that the Verizon iPhone 4 seems rather weighty! I don’t recall the AT&T iPhone 4 being so hefty feeling. Does the CDMA radio weigh more? Can anyone else confirm this? The Answers Just Keep Coming! A recent survey found that of current Verizon smartphone users, 66% of BlackBerry and 44% of Android owners plan to switch to the iPhone. Given that Verizon has the largest subscriber base in the US, that’s a LOT of smartphone defections. Is this a devastating body blow or a knockout punch to those respective smartphone platforms? Only time will tell, but I must say I was shocked when I read the article reporting the survey. Almost as impressive (at least for Verizon) is that the same research firm also concluded that 26% of current AT&T iPhone users will switch to Verizon. That’s a non-trivial number of subscribers jumping ship for Verizon. I expect that percentage to be higher in the areas most notorious for poor AT&T iPhone service, such as New York and San Francisco. I myself don’t plan on switching because I’m happy with AT&T’s service in my area and the ability to talk and use the data features of the phone at the same time is important to me. I wonder how many AT&T users realize that Verizon’s network does not support this ability? AT&T sure is trying to make sure people are aware of this with their latest series of commercials. Regarding the respective wireless networks, the article does touch upon the question of whether Verizon’s network will be able to handle the crushing load all those shiny new iPhones will place upon it. Either Verizon will be able to boast about its superior network, or AT&T will be vindicated for its perceived service issues. Also interesting to watch will be if AT&T’s network will improve if a quarter of iPhone users switch to Verizon. A thought just came to my mind. I wonder which provider Apple executives will use for their iPhones? Does anyone have any insight to Apple’s corporate cell phone policies? According to early news reports, the Verizon iPhone has already sold out pre-orders in less than a day. Verizon is crediting the iPhone with the “most successful first day sales in the history of the company”, stating that it broke all previous records in the first two hours. “…when you consider these initial orders were placed between the hours of 3 a.m. and 5 a.m., it is an incredible success story,” said Verizon Wireless CEO Dan Mead. Another point to note is that these sales were only made to existing Verizon customers. Customers new to Verizon have yet to be able to purchase a Verizon iPhone. So the questions of how well the Verizon iPhone would sell seem to have been answered. And it does not appear many people are holding off buying an iPhone until the summer. The next important question will be how many people defect from AT&T (and other providers) when the general public is able to purchase Verizon iPhones on the 10th (with pre-orders on the 9th). Another question that has been brought up is what Verizon will do with their customers who are not eligible for upgrade or promotional pricing for the iPhone. For many customers, it will be cheaper to switch to AT&T than to pay full price for a Verizon iPhone. Verizon may have a customer satisfaction crisis on their hands if they don’t tread carefully. It will be interesting to see how they deal with that. Verizon and Apple have been running some interesting commercials lately. They are basically celebrating that the iPhone will finally be available on Verizon’s network starting February 10th and giving thanks to Verizon customers for waiting so long. Current Verizon customers will be able to pre-order the iPhone starting February 3rd (at 3 AM Eastern time!) and new Verizon customers will be able to buy starting February 10th. This turn of events will finally bring the answers to many questions, some of which have been around practically since the iPhone was originally released. – How many Verizon iPhones will be sold? – Will these sales cut into AT&T iPhone sales? – How many AT&T customers will defect to Verizon? – Will these sales cut into Android, Palm Pre, and Windows 7 phone sales on Verizon? – In other words, will Verizon iPhone sales kill the other smartphone platforms? – Will Verizon customers wait until the summer to buy an iPhone, since Apple generally releases new iPhones in June? – Will those Verizon customers who buy now wish they had waited until the summer? – Will Verizon’s network be able to handle the load, or will it buckle like AT&T’s network did in places? – Will the fact that Verizon’s 3G network can’t support voice calls at the same time as data transmission (as AT&T’s network can do) affect sales? The answers to these questions will very likely determine the future of the smartphone market, so keep an eye out on this developing story over the next few months. The Wall Street Journal has published an article claiming that Verizon will announce the release of Apple’s iPhone on their network at an event Tuesday. In fact, Verizon has announced a special media event for Tuesday, January 11, 11 AM Eastern. This is a pretty strong claim to make by a respected news source. Add the fact that Verizon did schedule an event in a style reminiscent of Apple, and this seems to be very credible. Now the questions are how much will Apple be involved in this event, including will Steve Jobs make an appearance, and when will the “vPhone” go on sale? Given the fact that Apple has instituted a vacation black-out for its employees, it seems likely that the phone will go on sale towards the end of the month. Like I said prior, this should be an interesting few weeks.